I have been back from my trip for 5 weeks now and have reflected on how I have grown since getting on a plane May 19.
and it was a unique experience. Apparently there are catacombes like this all over Europe, so it isn’t so unique to Europeans. 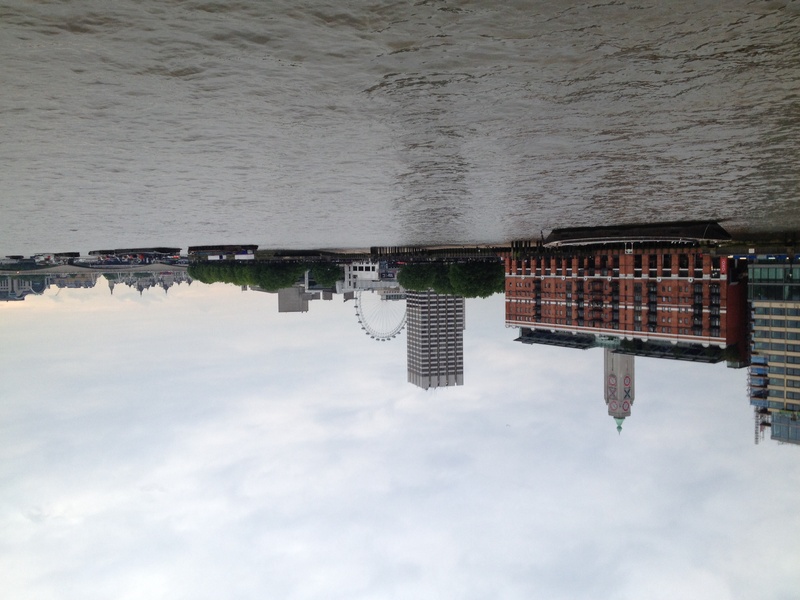 When I returned to London I had the better part of a day to explore as well. I bought souvenirs, walked the city, visited the Tate Modern and had one of the best days of the whole trip. Walking around London on my last day I felt connected to the earth, to spirit, to the source of all life. I felt strong and powerful. I knew I could do anything I wanted, it was now just a matter of deciding what that is. I was tired and missed my family, so I wasn’t sad to come home. What made me sad was not knowing when I would be back. After being alone for four weeks, especially the last 11 days as I couldn’t speak French and did not do a lot of talking, I was overwhelmed being surround by friends and family. My new-found space and freedom was replaced with things to do. I reverted back into old habits like watching television, not meditating and looking at Facebook way too much. I checked out more books than I had time to read from the library. I over committed my schedule, leaving no time for rest and relaxation. The awareness I gained during my trip made me aware that this hectic pace did not feel good. Now I am more careful with my time. This is my time to build my life the way I want it. To incorporate all that I learned during my travels. I still get excited at the thought of going somewhere and have become much more clear about the things I want to do and don’t want to do. I’m excited to see how my life unfolds in the coming months, and for new travels on the horizon! This weekend I am participating in Give Camp Cleveland (http://clevelandgivecamp.org). I have never done anything like this before, as I have always been too busy to commit a whole weekend to working for free. I am excited about what I will learn there and who I will meet! I took 10 days in Paris so I could really get to know the city. However, unless you speak really, really good French, that is not going to happen. You can visit the tourist sites and get the layout of the city. But to truly experience French culture you need to speak the language. It seems obvious, and it’s not like I expected to learn French culture and language in 10 days. But I thought I could learn by observation. Not so much. I still love it here. It’s like no where I have ever been. Of course everywhere I have been is unique in its own way. Every city/town has a pulse and therefore specific rhythm. I find myself wanting to spend time learning French and coming back. My pace has slowed in Paris. I’m sleeping in and lingering over coffee and breakfast. If I’m lucky I get out of the house around noon and see some sight, visit a museum or go shopping. Sunday I didn’t leave at all and read Forrest Gump! Today my plans got foiled by weather. It’s been raining in Paris and I wanted to cruise the St. Martin Canal. With the weather I decided to visit the Catacombes instead. When I got there it was pouring down rain. The line was outside so I ducked into a cafe to wait it out. About 3 pm it seemed to let up so I got in line. A nice man working for the Catacombes let me know I was welcome to wait but I probably wouldn’t get in as they take the last tour at 4 pm and the wait was longer than an hour. Then the rain started to pick up. C’est la vie. I’ll try again tomorrow, earlier this time! On my way back from Westminister Abbey the Tube line I needed to take was down, and I was running a little late. Luckily another one was close by and I was able to make it to St. Pancras for my ride to Paris. 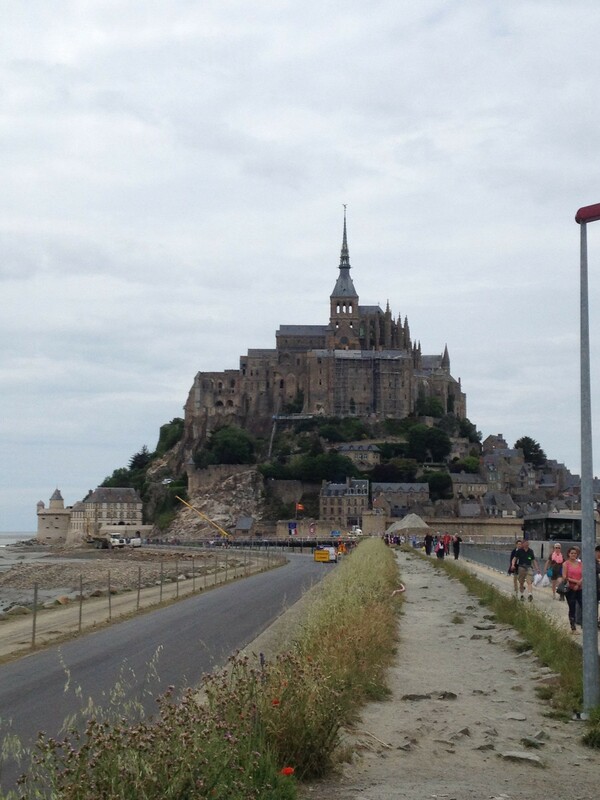 After dinner I headed back ‘home’ as I needed to get up at 5:30 ( which is 4:30 UK time) and catch a train to see Le Mont St. Michel in Normandy. This church was built on a large rock starting back around 400 AD. Gradually it became an abbey that housed monks and a village grew up around it. Le Mont used to become an island at high tide, though a dam built has left large sediment deposits building up the land around it. They are working on building a new bridge /road and a new dam to restore its natural island nature. The streets are very narrow and full of shops and restaurants. A unique thing to see. The abbey itself is awesome and I was able to witness a mass, which they hold every day. The views are breathtaking! On my third day in Paris I slept in, caught up on posts, will do some laundry and go to the Louvre later as it’s open until almost 10 tonight. So after a restful train ride back into London, I drop my bag and hit the streets. The subway line I wanted to take to Buckingham Palace is down so I took another route and got off at Piccadilly Circus. This place was indeed a circus! Crazy amounts of people. I took some pictures and then headed for Trafalgar Square. I saw St. James park and fell in love with this place, it was beautiful and people were lounging on chairs and oversized bean bags. The sun was coming out and it was a great night to be in the park. I made it to Buckingham Palace then back through the park to see Big Ben, Parliament and Westminster Abbey. The Abbey was closed but I went in 2 days later and had a celebrity sighting. 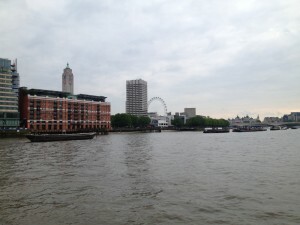 The night was young so I took a riverboat tour of the Thames and saw London from a different perspective. 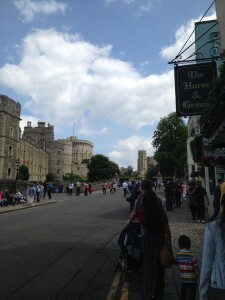 The next day I headed to Windsor castle at the advice of my friend Scott. It is the largest castle in the UK and where the Queen lives most weekends. A tour of the State Apartments shows you all of the rooms they use in public ceremonies, knightings and where the Queen receives important guests. 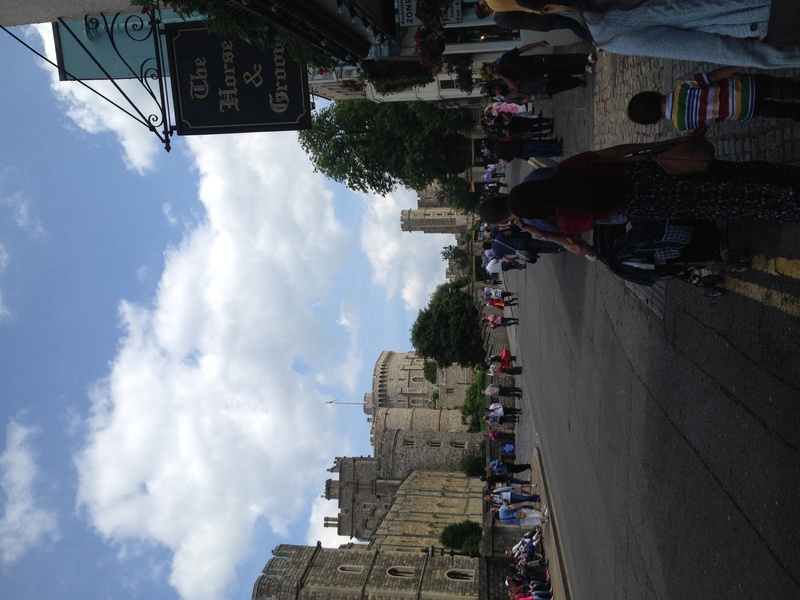 Windsor is its own town with lots of shops and restaurants. I wonder what the Queen thinks of all these people buzzing around her house all the time? Cardiff seems to be a party town. I was there for three nights on the main street and every night the bars were hopping and people were out having a good time. My first night there I went to see Cardiff Castle. This castle is built on the remains of Roman walls and has its living quarters well preserved. The last occupant had some serious style and lavishly renovated the place. There are intricate paintings and carvings richly painted all over the castle. 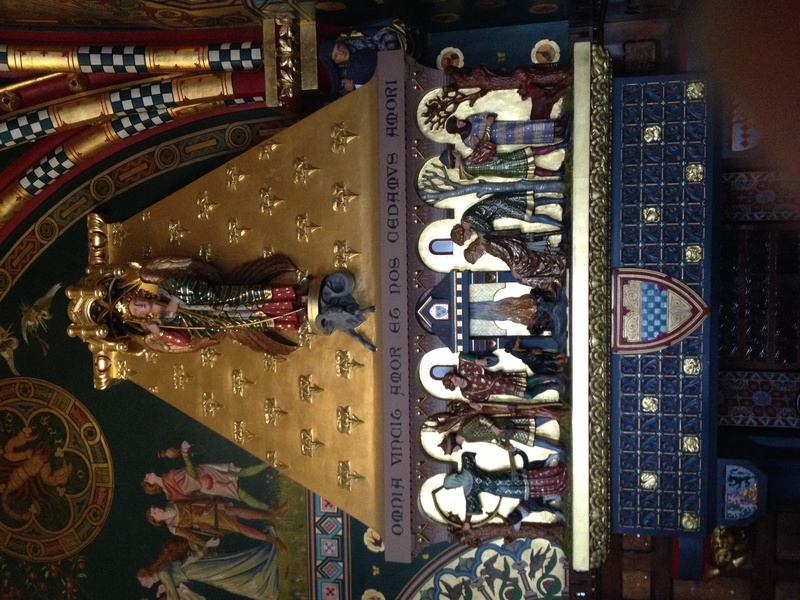 He loved astrology and symbology so there is a ton of that in the decor. He also made sure it was kept in good condition along with other historical places in the area. 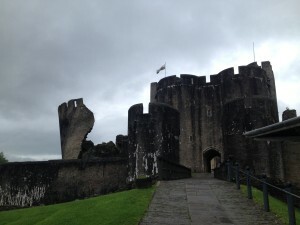 The next day I went to Caerphilly Castle, the second largest in the UK. This place was cool, lots of places to explore. It reminded me of Trim Castle in Ireland. 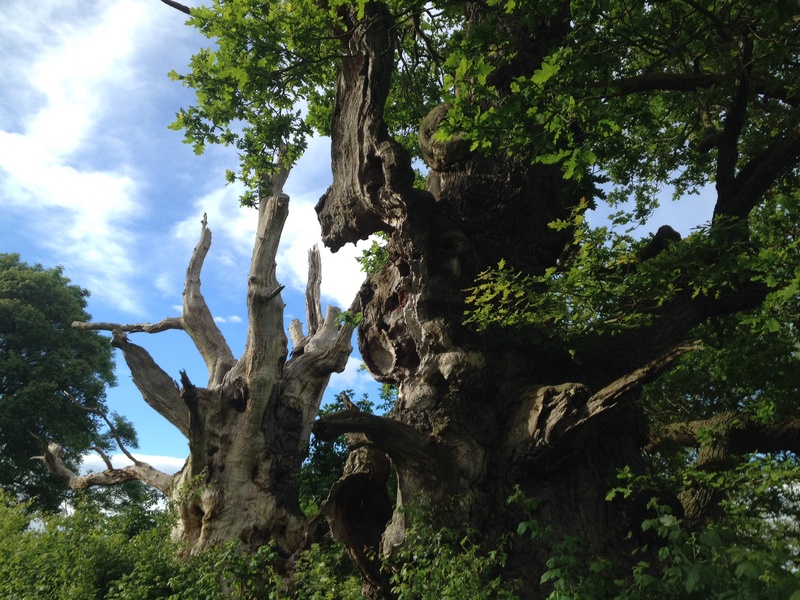 It has quite a bit of historical significance during the days of Edward I. One of the towers is blow away from the rest of the castle and is at a wicked angle making it look pretty cool. When I got back into town it was early afternoon so I started exploring and found Bute Park named for the Marquess of Bute responsible for decorating Cardiff Castle and preserving Caerphilly. This is my favorite place in Cardiff; it’s the Central Park of Wales. 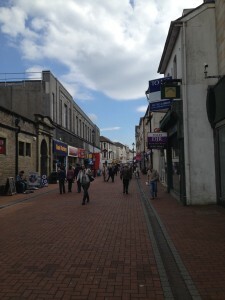 My last day in Cardiff I traveled to Neath and Briton Ferry where my great grandmother was born. In Briton Ferry I was dissapointed to see that her street is gone. I walked around for an hour but its purely residential here. It was an old steel mill town and my great great grandfather worked in the mills. The mills are gone now and most residents now travel to work outside the city. 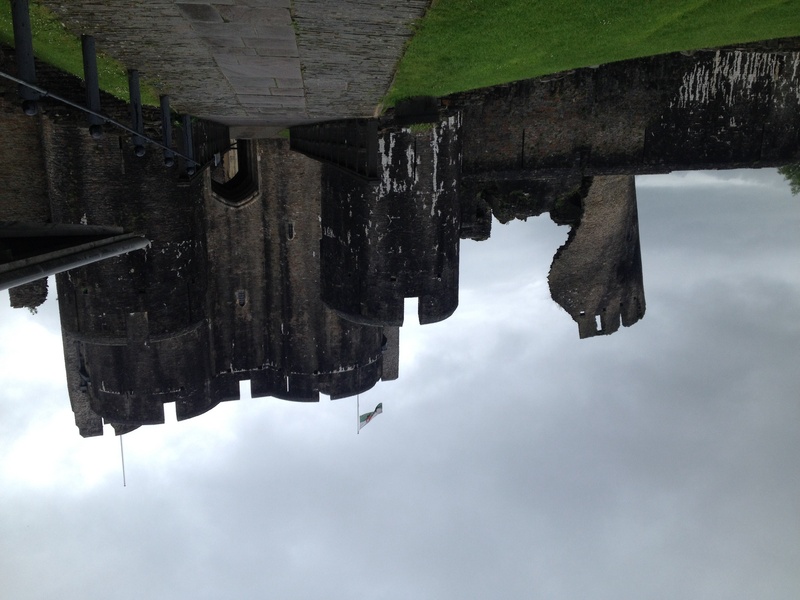 Neath is only 10 minutes away by bus and it has a market, shopping, an old castle ruin and a great little park. It was a very pretty town and I got to learn what a ‘cwtch’ (pronounced cotch) is, a Welsh cuddle! The nearby town of Swansea is a vacation destination for its beautiful beaches. Unfortunately the weather hasn’t been good and I hear it’s not worth the trip. Physically I am getting pretty tired. My knees hurt from all the stair climbing. I have a roommate that invited me to a show but I was too tired to go. Time for resting up. That night I was laying in bed reading by 6 and felt better the next day. I took that day easy as well as I was traveling back to London by train and new I wanted to hit the ground ‘running ‘ when I got back! The travelers in Bath were mostly vacationers. They had time off from work and wanted to see Bath. I met 2 girls from Leeds. Apparently if you are a teacher there is a lot of work in Leeds. One girl was American and one was Australian. They were in Bath because they had a week off from teaching, a school break. I took a tour to Stonehenge because it also hit some Cotswold Villages and the Avebury stone circle. Luckily we got to Stonehenge early because the crowds really come in. It felt good on the site, and it commands reverence for sure. But you can’t get near the stones and there are a lot of tourists. After Stonehenge we went to Avebury where the whole town is inside a stone circle. The stones were knocked over and harvested for building material until someone noticed what they were and put them back. It was way bigger than the remaining Stonehenge circle and you could walk around the stones. It’s fascinating how these structures line up with solstice sunrises and sunsets and what that could have meant for their purpose. I found the perfect stone to lean up against and chill. My fellow tour mates were American and Canadian. At lunch in Lacock I sat with Hillary and her mom. They are from Philadelphia and she is going back to school for her teaching degree. Lacock is a gorgeous medieval village. The youngest pub in town is from the 1600’s. We finished up at the village of Castle Comb. It had beautiful medieval houses and thatched roofs. I could chill there all day. And that would be about all you can do there. There is a pub, a small shop and some accommodations. That’s it! 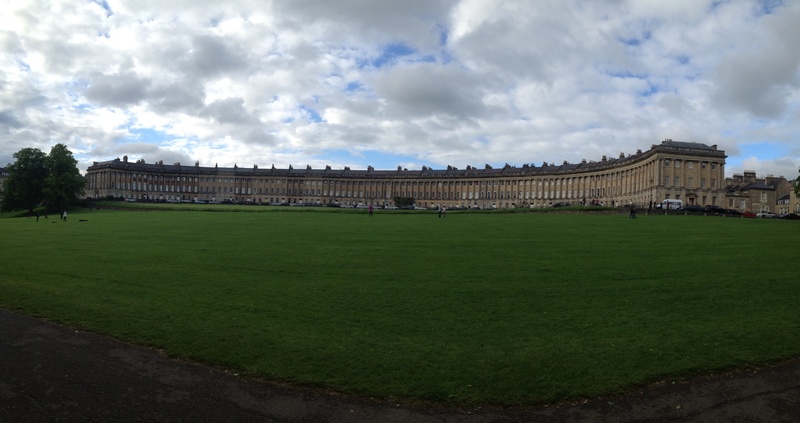 My last day in Bath I toured a townhouse on the Royal Crescent, took a boat ride up the River Avon (one of 9 in the UK), and climbed 212 steps to the top of Bath Abbey. This was a nice tour because they took you into the clock room and the bell chamber. Their liability insurance must be expensive because those stairs are no joke and those little rooms had low ceilings. I had a great time in Glastonbury and met some fabulous people. I consider myself initiated into the backpacker club because 2 of my bunk mates, one who has hitched her way through Europe and the other currently working/camping her way around Europe were both impressed with how little I was traveling with. I got a knack for this traveling thing! The first thing I like to do in a city is just walk around, get lost and then try to find my way back. This gets me oriented quickly so the rest of the time I can just zip around to where I want to go. Plus it’s fun! And I don’t even look lost because other tourists ask me for directions. I was getting hungry so the first thing I did was look for food. I found a good fish and chips place but they weren’t open yet, so I got a cappuccino down the street and caught up on my journal. When they were open I went in and placed my order. We were having a good conversation so I asked if I could eat there (it was a takeaway place). We were talking about my trip and where I had been and where I was going . They pointed out there was a club right next door known for ‘hen’ parties (aka bachelorette parties) so we watched the party girls for a while. A couple came in to get some chips and started telling about last year when they won Disney’s first family competition and got to spend the night in Cinderella’s castle. After that I continued to walk and found the Royal Cresent and the Circus. These are iconic housing structures from The Georgian period. Apparently Nicholas Cage owned one but had to sell it due to some tax trouble. I went back to the hostel to rest up and got acquainted with 2 of my roommates. They are from Holland and are renting a car and traveling around the UK for a week. We talked about traveling as a European vs. an Anerican. They travel to countries like we travel to states. They didn’t care how many countries I visited, but how many states I had been to. They told me a few places to check out when I get back to London. This morning I got up and went to the Roman Baths. This is the best preserved site in the world of its kind. 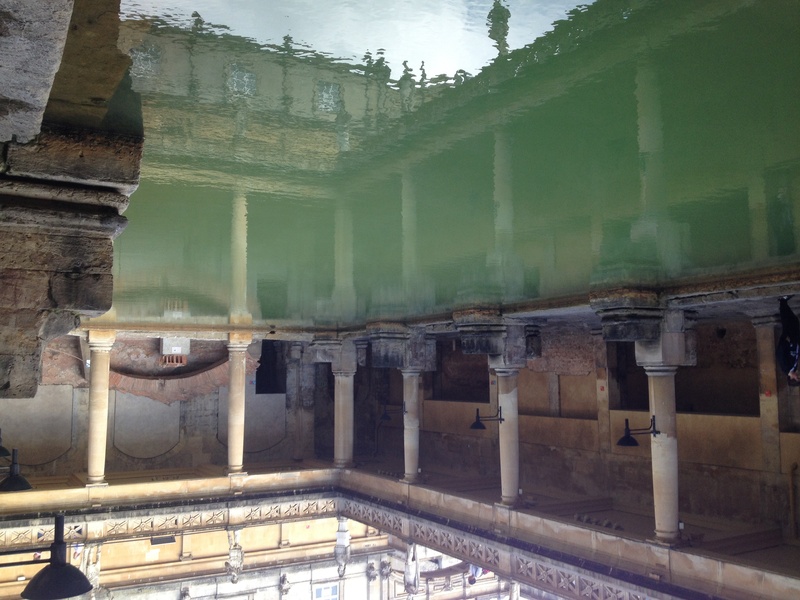 Hot springs feed up and the Romans turned them into public baths. The one here in Bath had some special features that other ones don’t. It was also used as a religious center. 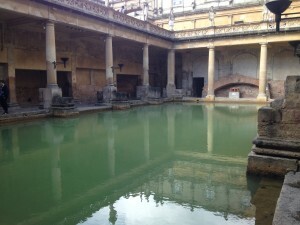 Roman Baths were like a Spa and Country Club in one. Later the English used them in healing. After the baths I saw another roommate and we went on a walking tour of the city. Great tour and 100% free. They even tell you up front they won’t take any tips at the end. After lunch I visited the Fashion Museum and now I’m relaxing in the common room with a cup of coffee. Tomorrow I take on Stonehenge! I’ve been staying in Glastonbury for the past three days. Thursday I climbed the Tor which is a big hill with a church ruin on it. Glastonbury has lots of myths and legends. It was thought to be the Isle of Avalon, a mystical power center at the time of King Arthur (if he actually existed). The Abbey here was the richest in all of England before The Reformation. Joseph of Arimathea was here, some say he brought a young Jesus. Some say he buried the Holy Grail in the Abbey. The Abbey also had the remains thought to be King Arthur and Lady Guinevere. I took a ton of pictures from atop the Tor, but none of them do the views any justice. It’s absolutely breathtaking. Because the land is so flat around the Tor you can see most of the county of Somerset. After the Tor, I hung out in town checking the shops. Then I met Kimberly at Chalice Well. She gave me an awesome insider’s tour. Then I got the idea to find the two oldest trees in the UK named Cog and Macog. I walked about a mile and a half and I’m still not sure I found them. I took pictures, but the locals said they thought the trees were gone. When I showed them what I found they assured me that was them, but I think they were just trying to make me feel better. Cog and Macog, is that you? 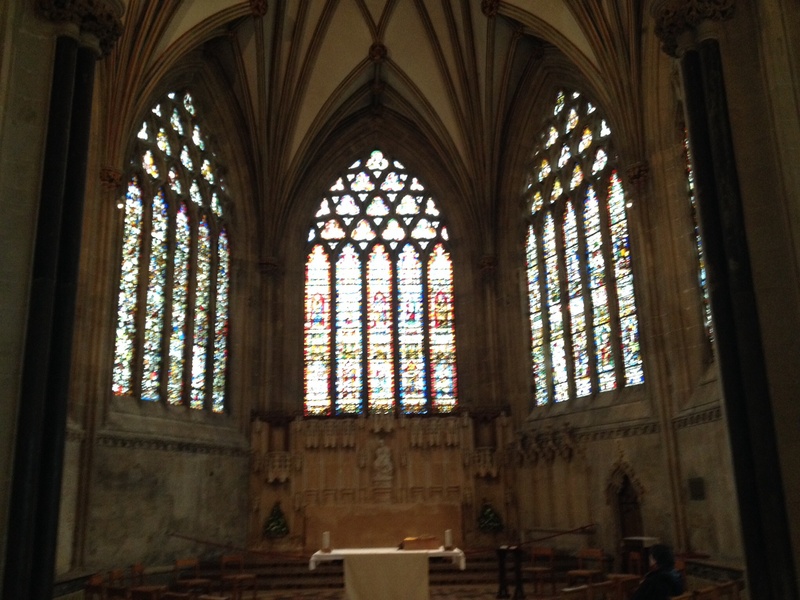 On their suggestion, I took a trip to Wells on Friday to visit the stunning Cathedral. Again, pictures don’t do it justice. Also there is a beautiful feeling to the place. 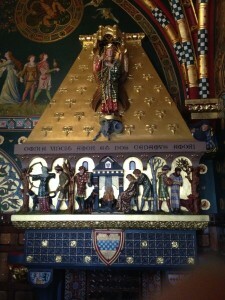 Particularly in the Lady Chapel. I’m not the only one who felt it either, others remarked on it as well. 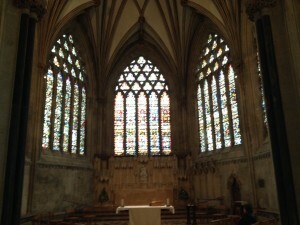 The Lady Chapel of Wells Cathedral. Upon returning to Glastonbury I cleaned up and headed to The Market House for another round of fish and chips as well as to say goodbye to my friend Chloe who works there. I hope to see her again someday! After dinner my friend Lena and I went for a nice walk and then back up to our room for a good discussion about working on the road, places we’ve been, national healthcare and life in general with our other roommates. It was a splendid day! Yesterday I spent the whole day running like crazy to get as many tourist spots checked off my list in London. Fun, but exhausting. And disappointing because I missed something on my itinerary. As I left Kensington Palace, disappointed that I didn’t get to see Westminster Abbey, I reflected on how truly awesome my day had been. I’m in freaking London! Today I took my good ole time getting up and getting breakfast. Then made my way to the train station a good hour ahead of time. I spent my hour people watching and just being. I had the best time! I remembered that life is about people,not things. I boarded the train to Bristol where I caught a bus to Glastonbury. During this trip I realized I could have the best time simply riding a bus through the UK. I saw and felt so much beauty! I got to Glastonbury, checked in and went to the first place that had free wifi so I could check in with worried parents at home. I met two of the fiercest women Magda and Chloe who work here at Market House (free wifi!). We chatted for about an hour until they got busy and I have my summer vacation planned for next year! Anyone care to hit UK Summer Festival season??? I also ran into Kimberly and her husband Bob. Kimberly who is a former advertising exec turned Reiki Practitioner. She’s offered me tour of Chalice Well tomorrow and valuable advice on the rest of my trip. I feel so blessed to be able to do this and meet these beautiful women! Tonight I packed all my stuff. 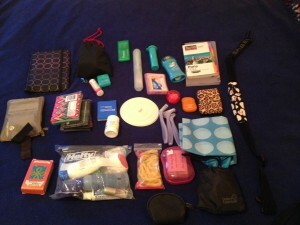 I must admit even I amaze myself as to how I get everything in one bag. But I am pretty good at it! 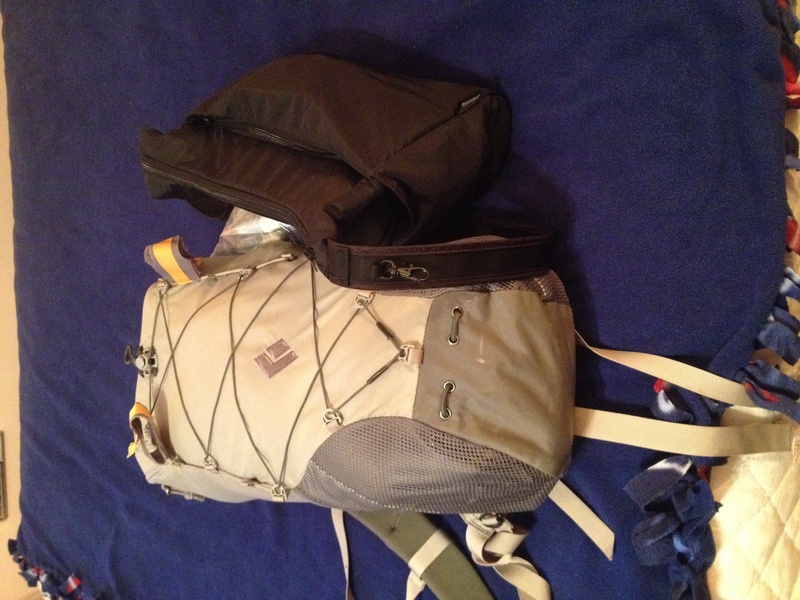 The gear, as I refer to it, consists of my electronics, personal hygiene, pharmacy, laundry and entertainment. I’m bringing my Kindle, iPhone, credit cards, soap, shampoo, toothbrush and toothpaste, Kleenex, various pain relievers, bandaids, clothes line and laundry soap. My good friend Tracie also got me an eye mask, earplugs and a funky travel journal. 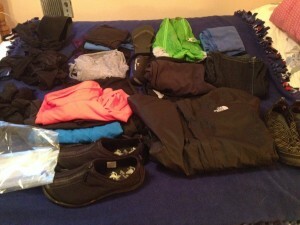 She also provided the green day pack you see with the clothes. The clothes I’m packing are 2 pairs of lightweight pants, a pair of jeans, 2 pairs of shoes, flip flops, 2 pack towels, 3 tank tops, a t-shirt, 3 long sleeved shirts, pajama pants, a rain coat, a belt, a sleep sheet, a daypack and plastic baggies. Looking at it laid out I was sure there was too much, but alas! It all fits! All packed up with somewhere to go! I may lighten things up a bit tomorrow after thinking about it, but I think I got all the important stuff.